What this Everton player from Argentina said about the Falklands is a DISGRACE! Today is a national holiday in the banana republic of Argentina as they celebrate the day they invaded the Falklands Islands and fought a ten week war against the British where of course they were soundly beaten. The defender posted the words “Las Malvinas son Argentinas”, which translates as “the Falkland Islands are Argentine”. 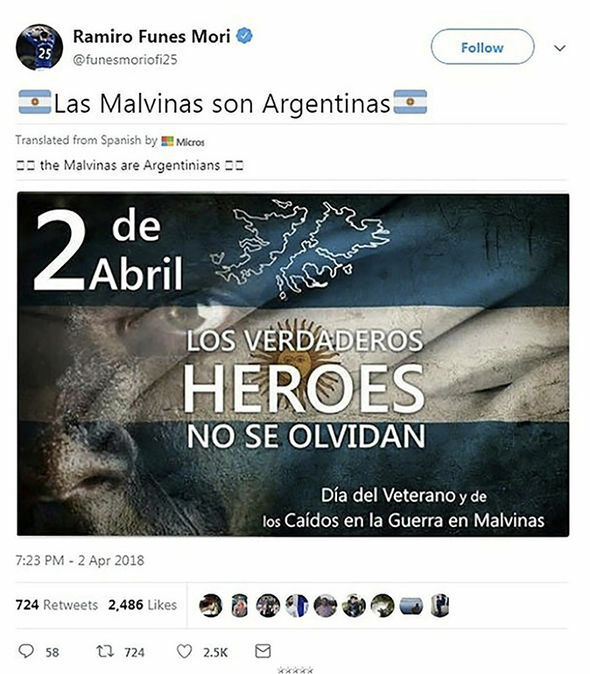 He accompanied his tweet with an image of the date along with the words “Day of the Veterans and Fallen of the Malvinas War” and “The real heroes are not forgotten”, also in Spanish. Las Malvinas is the Spanish name for the Falkland Islands, which lie about 300 miles off the coast of Patagonia in south Atlantic. The Falklands which are still claimed by Argentina, became a Crown colony in 1840, and remain a British Overseas Territory, with Queen Elizabeth II as its head of state. It is home to almost 4000 people who are fiercely loyal to Britain. His tweet has sparked fury amongst Everton fans with many calling for him to be sacked immediately! We at UK Unity say sack him now and send him home! Read: "LEICESTER EXPLOSION- Stunning new revelations in court case revealed!" Read: "Labour MP Naz Shah in fresh outrage!"